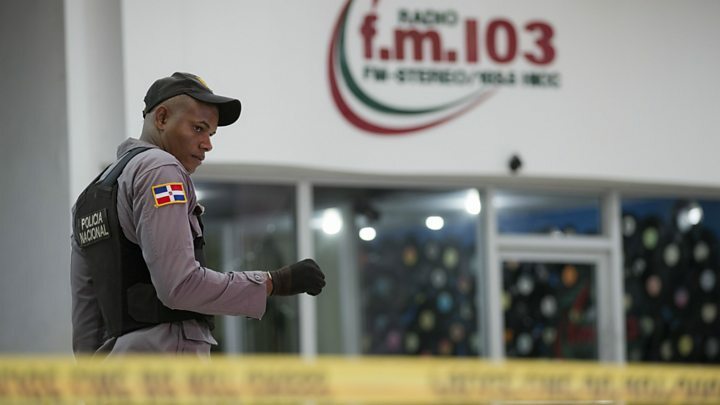 Three men have been arrested after two journalists were killed during a live radio broadcast in the Dominican Republic. The footage showed his broadcast interrupted by gunfire and a panicked woman shouting "Shots! Shots! Shots!". Police said the shooting happened on Tuesday in San Pedro de Macoris, east of the capital Santo Domingo. The two journalists killed were presenter Luis Manuel Medina and radio producer Leo Martinez. A woman was also injured and is undergoing surgery, said local authorities. The arrested men have not been charged and police say they do not know the motive. "The investigations have begun and we will try, with all the means in our powers, to reach the truth," Attorney General Jean Rodriguez told the local press. In August 2015, two US journalists were shot dead during a live TV report in Virginia.